There’s been a distinct lack of new Magento content here for the last few months. That’s because I’ve been busily beavering away on our latest internal project which I’d like to share with you. It’s only partly Magento related, so bear with me. We’ve created a multi-channel mobile sales dashboard on Google App Engine called OrderPipe, and it’s now been made publicly available. 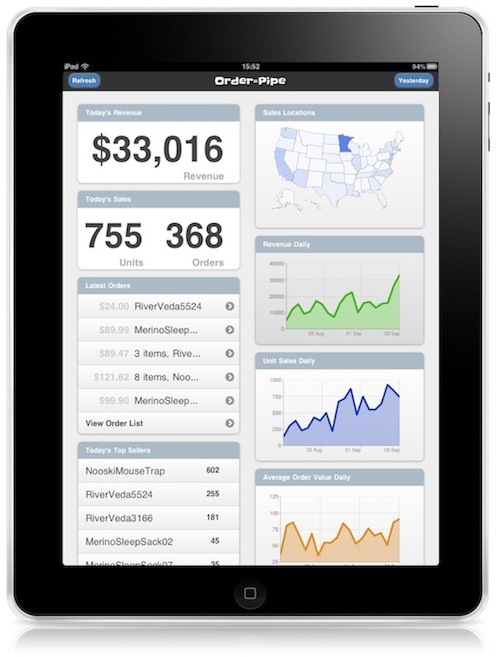 It aggregates order data from multiple online sales channels for consumption on mobile and desktop. We launched a private beta trial at the end of September, and are nearing a point where we’ll be making it generally available (albeit initially free) to everyone. I thought I’d take this opportunity to tell you about it, what it does (technically), and why it may interest you. In this post I will cover a simple way to configure Magento to use the Amazon CloudFront CDN service and to create a CloudFront distrubution that mirrors the static files in your site. This method relies on the custom origin functionality announced late last year when CloudFront came out of beta. But first, a little background. A CDN (content distribution network) is a network of servers that puts your files and content closer to the user requesting them, and thus they can get the quicker. Using a CDN has a nice side effect of offloading some work from your own server too – which if you use Apache means less processes on your server for each customer. When Amazon first announced CloudFront I got very excited about the prospect of writing an extension to automatically sync a Magento store’s media with an S3 bucket, to enable this simple, affordable CDN solution. Alas, it turned out to be quite hairy dealing with the subtle race conditions that can occur when first accessing a specific media file that may not be available on the CDN yet. With the introduction of custom origin functionality there is no situation where the CDN won’t have the file. If the CDN doesn’t have the file, it gets it from the underlying source server, if it already has it, it serves it. This means the first request for a file will be a bit slower, but after that it’ll be quick. So to make a CloudFront distribution work in Magento it only takes two steps.